Are you familiar with the acronym JADE? It's a reminder to not justify, argue, defend, and explain. 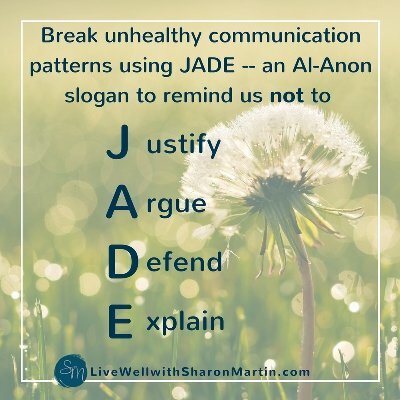 If you're you repeatedly drawn into conversations or arguments that seem to go nowhere, feel compelled to respond to accusations that you know are false, or feel like you have to justify your behavior or choices to a "difficult" family member, please read on to learn about JADE. Codependent traits generally develop as a way to cope with trauma and often include high levels of shame, the feeling that we’re flawed and inadequate, low-levels of self-esteem, difficulty trusting, wanting to please others and keep the peace, perfectionism, and wanting to feel in control. These traits contribute to our compulsive need to take care of or “fix” other people’s problems, prove our worth, and please others. And our fears of being inadequate and rejected, lead us into destructive communication patterns in which we feel we must justify, argue, defend, and over explain ourselves. Practicing loving detachment is a healthier alternative. We feel like we have to justify our behavior and choices because it’s very painful for us, as codependents, to have others upset with us. The bottom line is you don’t owe anyone an explanation or reason for your choices. And if you do give one, people who are bullies or narcissists will try to use it against you. Don’t give them this ammunition. 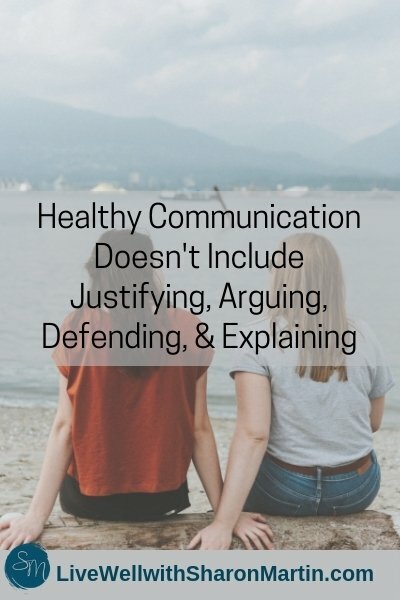 In this context, arguing doesn’t just mean disagreeing (which is a normal part of a healthy relationship), it refers to yelling, name-calling, rehashing the same disagreements repeatedly without resolution, or blaming. This type of arguing doesn’t resolve problems or help you understand others better; it generally creates a bigger wedge between you and others. When you feel attacked, it’s natural to want to defend yourself. And while I whole-heartedly believe in assertively standing up for yourself, you have to know who and what you’re dealing with. Sometimes, verbal attacks are manipulations or ploys to get a rise out of you. They’re part of a recurring destructive pattern to draw you into an argument. Codependents tend to be sensitive and it’s especially hard for us to choose not to respond or defend ourselves. We tend to over-explain ourselves because we’re afraid of upsetting others and we don’t feel it’s valid for us to make our own choices or do things for ourselves. Because we’re very afraid of rejection and criticism, we over-explain ourselves in order to prove that it’s acceptable for us to set boundaries, spend money on ourselves, or even make a mistake. Recognize that you don’t have to attend every argument you’re invited to. In other words, you don’t have to participate; you don’t have to take the bait. It helps to identify and be aware of how others push your buttons. What words or topics tend to set you off or compel you to justify, argue, defend or explain? Knowing this gives you the power to see these traps and learn to respond differently (or not at all). Sometimes it helps to directly state, “I’m not interested in arguing with you” and either change the subject or walk away. Before you say or do anything, take time to collect yourself and think about how you want to respond rather than just impulsively reacting in the same old ways. This takes a lot of practice, of course. 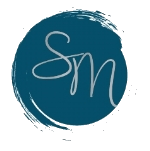 It can help to have something (perhaps a mantra or a small object in your pocket to ground you) to remind you of your goal to slow down and think before acting. Mentally rehearsing your desired response to antagonizers can also make it easier to respond differently in the heat of the moment. Use your feelings to guide your decisions. When feelings of anger, resentment, fear, discomfort, or mistrust show up they are letting you know that something is off and you need to switch paths. I think we all have a gut feeling about what’s right and what’s wrong for us; we just need to listen to it! If you’re not used to noticing your feelings, make time to purposefully ask yourself how you’re feeling throughout the day. Also, remember that feelings can show up in your body. So, if your muscles are tense or your stomach is upset, it’s also a good time to check-in on your feelings. One of the keys to breaking codependent patterns and not justifying, arguing, defending, or explaining is to focus on your behavior and choices. We often get distracted by our desire to change and control others. This is not only futile, but it draws us away from what we can control – and controlling ourselves is where our power resides. Tending to your basic needs (eating healthy food, drinking enough water, getting enough rest and sleep, exercising, connecting with positive people, processing your feelings and giving them a healthy outlet, practicing your religious or spiritual beliefs, etc.) can make a huge impact on your mood and energy. It’s much easier to hold your tongue, leave the room, choose to do something different, set a boundary, or detach when you’re at your best physically and emotionally. Photos by Aaron Burden and Priscilla Du Preez.